Cromwell clean can provide house spring cleaning & carpet cleaning services in London and surrounding counties. Each home is unique; our team of cleaners can be trusted to understand the different demands of our customers and to provide the friendliest, most discreet cleaning service. Whatever your idea is of time well spent, we're pretty sure it doesn't include dusting, vacuuming or scrubbing floors. That's our job. Cromwell Clean services gives you back the time you want to concentrate on the things that you enjoy. Our years of experience in domestic cleaning has taught us that every home is as unique as the people living there. Our Residential cleaning services are individually tailored to suit you and your home. Working with landlords and tenants, letting agents, property and facilities managers. Whether it be pre-post-tenancy or during occupancy we deliver a reliable service that you can trust. All our staff go through a rigorous interview process, are CRB-checked and undergo full training. 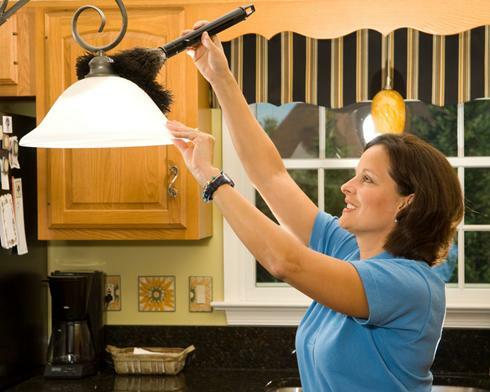 A reliable and consistent domestic cleaning service you can count on time and time again. Your home cleaned just the way you want it, we guarantee it. If for any reason you are not satisfied with the cleaning service we have provided, all you have to do is contact our office, within 24 hours of our visit, and explain the problem. ‘’We listen to our clients and provide a service where we recognise that"
We can professionally clean your kitchen equipment including the oven, use our specialised equipment to clean your carpets, soft furnishings, curtains and hard floors as well as making sure that every aspect of the property is thoroughly clean. These types of cleans are bespoke, to advise on pricing we’ll need to speak to you about the project and the property to determine what is required. If you are in need of a professional spring clean, whether it’s for a commercial or domestic property, Cromwell Clean can offer tailor made cleaning solutions to suit any requirements. You can be assured that we have highly skilled, trained and experienced individuals with the best equipment available to get the job done. Have you had any major building works done recently, added an office onto your warehouse or conservatory onto your home? Building works often generates a great deal of dust and dirt. As all our cleaners are fully trained to the highest standard, you can feel confident that you have employed a professional cleaning company with all relevant expertise. Our results are achieved through using state-of-the-art cleaning equipment, environmentally friendly industrial strength cleaning solutions to provide you with an environment that is spotless and ready for you.